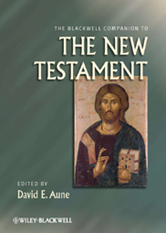 The Blackwell Companion to the New Testament is a detailed introduction to the New Testament, written by more than 40 scholars from a variety of Christian denominations. Treats the 27 books and letters of the New Testament systematically. Considers the historical, social and cultural contexts in which the New Testament was produced, exploring relevant linguistic and textual issues. An international contributor list of over 40 scholars represent wide field expertise and a variety of Christian denominations. Distinctive features include a unified treatment of Luke through Acts, articles on the canonical Gospels, and a discussion of the apocryphal New Testament.